All Rise… This Court of Law for the Law West of the Pecos is now in session…The Honorable Judge Billy Bob Bean. Presiding…all those wishing justice come forward and be heard! Good day to all of you. 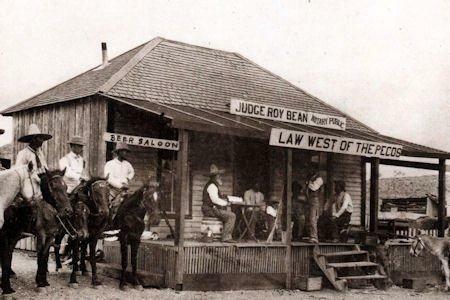 I am Judge Billy Bob Bean, the younger, smarter, and, ahem, better looking brother of Judge Roy Bean, who, God rest his soul, presided over this court for so many years. We are here to speak of the law and justice. All who wish to be heard may do so and be not afraid of ‘ole Billy Bob…..unless you do something I don’t like. So let’s get started. First, I have some rules I want to explain to you. I have some beliefs that I want to give you, BEFORE you appear before me and make some foolish mistake. The most important rule I have is that you do not have to be an attorney or lawyer, (they are the same, but some people in places like Philadelphia or New York prefer “Attorney” to “Lawyer”), to appear in this court. I prefer to hear from a group of people that many lawyers have forgotten about, or don’t think about, their clients. I prefer to hear from them directly. I don’t like most lawyers, or attorneys, that I know, so you are better off in this court without one. The second rule I have is… I am always right so listen carefully, speak carefully, and don’t make me mad. My last rule, you may call me “judge”, “your honor”, “BBB” or, if we are familiar, “BB” will be OK also. I see my friend Mark Ramsey here. Mark, you are not an attorney so I like you a lot already. What’s your question? BB, I wrote a piece about the EPA taking some poor souls for a terrible time in Montana and they were stopped from doing so by the US Supreme Court. What do you think of that? Well, the EPA has been on a “holy tear” for about 10 years, but in the present administration, they have become a holy tear on extreme steroids. Let me explain. The EPA for several years has taken a position that it has authority over water that may be around anywhere in the US. Their original authority was over “Navigable Streams” which meant water where ships could and did sail. But they became more aggressive and started saying streams, that ended up pouring into a navigable river, like the Mississippi River, were also navigable. It got worse as time went on. They added “wet lands” to the list, which meant almost anything they wanted to control they could. The EPA also said that no one could challenge their authority or their legal position about what they controlled until after they had completed their administrative action, which would be years. Here is the catch, they levied fines for any of those they thought were violating some rule for EVERY DAY they did not correct the supposed problem. Fines like $25,000 a DAY! They intimidated everyone into just giving in and settling with them. All that got worse in the present Administration. On day one they struck out in every direction they could, going after every business or industry they could, asserting the most outrageous positions, and in each case being very anti-business and without even attempting to work with these companies. They took the above fiction about navigable waters and spread it everywhere. The head of the Region VI office of the EPA, which covers all of Texas, was filmed in a “controlled rant” telling his employees the EPA was going to “crucify” businesses and individuals to “make examples” of them and to intimidate all the other businesses in the process. This is an agency of the United States Government saying they were going to crucify, or prosecute citizens of this fine country to intimidate them, just like the Nazis did in Poland, Austria, and France. They were talking, walking, and acting like thugs. They began taking completely outrageous legal positions intentionally to intimidate fellow citizens of the U.S. They forgot that they are public servants and with emphasis on the word SERVANT. They cost our businesses and citizens millions of dollars with this purposeful illegal motive and action. How many jobs did we lose because of this behavior? This agency, and this Administration, was and still is out of control. They are abusing the law by purposefully miss-interpreting simple, clear words to expand their power over private land, individuals, and private businesses. Well, the United States Supreme Court said “We’ve had enough!” Good for them. As you pointed out, a 9-0 decision against the EPA. That means that there was never any legitimate basis for the legal position the EPA was taking in the case. Not even the liberals on the court could find one. Now, there is still much more to be done. The EPA Region VI Administrator has issued a written apology and resigned. A good start. The EPA Administrator should issue a written letter of apology to the entire nation and she should resign. If the Administration will not fire her (since they told her to do this I doubt they will do so), then Congress, or even the State of Texas or the American people themselves should seek her involuntary removal and without pay. The EPA is taking unreasonable positions about their authority and the law everywhere they can. The State of Texas has sued EPA, successfully so far, about the way they have treated the Texas Commission on Environmental Quality. Good for Texas and our Attorney General, Greg Abbott. Don’t mess with Texas! I think the US Supreme Court is finally waking up. Also, businesses and State governments are getting tougher and are throwing off the yoke of intimidation the Administration has put on them and are bringing principled law suits against this illegal government action. The Supreme Court can’t rule if they don’t have a case before them. So I think states, businesses, and citizens should start banding together and standing up to the jack booted action of the Federal Government. Any comments, Mark? Just one, BB, do you have any strong feelings about this?!?! Naw, just another day at the office.